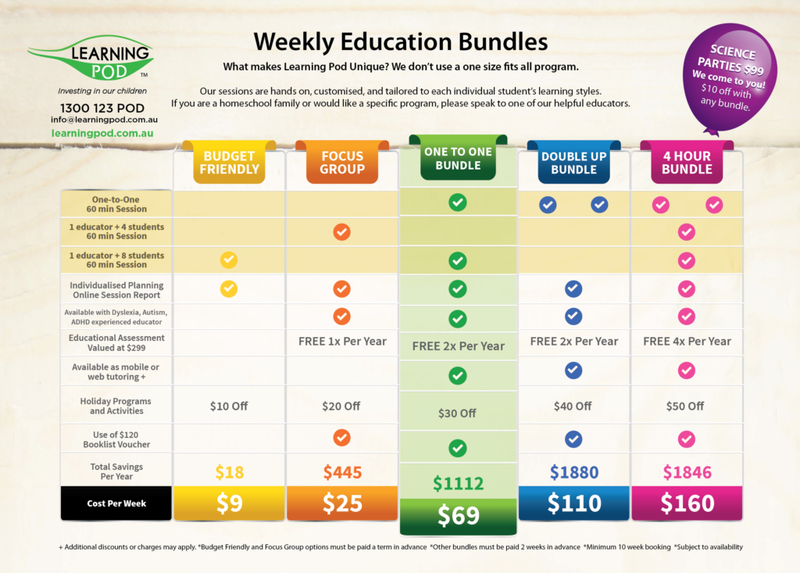 At Learning Pod, we do not use a one size fits all tutoring program. We focus on customised education, tailored for the individual child. We create an individual education plan based on the specific learning style of each child. We love hands on learning! Our 60-minute one-to-one sessions are pre-planned for the individual student and available from Kindergarten—Year 12 ATAR. We have a team of experienced and passionate educators and their teaching programs are overseen by a qualified teacher. We have educators experienced with additional learning needs such as Autism, ADHD, and dyslexia. The second hour in this bundle is for a 1:8 group and is optional and subject to availability. Our casual sessions may suit students who need help with a one off assignment or preparation for an exam. We recommend regular tutoring for the best outcome for your child’s education. Our ongoing students receive an educational assessment included in their first session. Educators can then focus on specific areas needing improvement or extension. After each session, you will receive a personalised online report about what was covered in the session and what will be looked at the following week. Our one-to-one sessions are available in store, online, or mobile—we can come to you! Our assessment assesses students on Maths, Spelling, Reading, and Writing skills aligned to the Australian Curriculum. The assessment has been scientifically designed to identify gaps within essential Maths and English skills. Recommendations will be made by our experienced educators for future progress including a tailored program for the student’s individual learning style. Included in one-to-one sessions and one-to-four focus group or can be book separately for $299. Includes an educational assessment, available from Pre-Primary to Year 12 ATAR. Focuses specifically on individual learning goals with a maximum of four students per group. Perfect for extension, catch up, or additional assistance allowing plenty of attention for each child. Perfectly suited as a top up to consolidate the learning in one-to-one sessions or additional homework support. A maximum of 8 students in similar year levels will come together to work on English and Maths skills. During the school holidays, while our tutoring continues, we also offer many fun Science and Art based activities as well as educational top up programs. These are all offered as “drop and go” options to give parents a well deserved break too. Check https://learningpod.com.au/events/ for times and classes.